Edinburgh: A. & C. Black, c.1870. 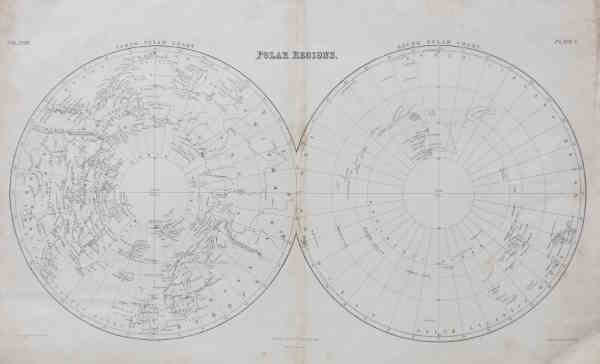 Hemispherical maps of the Arctic, south to the British Isles, and Antarctic, north to the Falklands. Paris, c.1770. 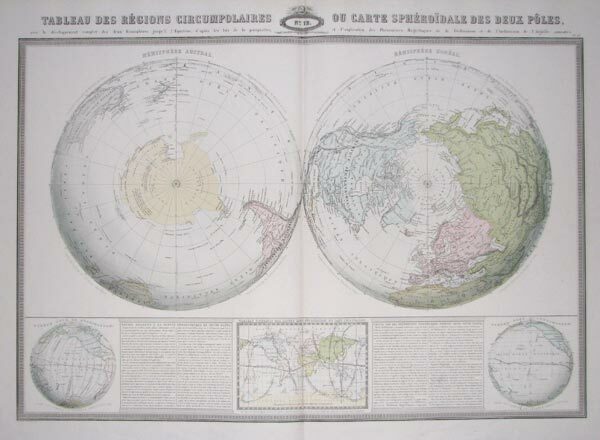 Double-hemisphere world map, but centred on the Poles. On the map is the 'Mer de l'Ouest', the mythical inland sea in North America. The eastern coastline of Australia is unbroken from New Guinea to Tasmania, via New Caledonia. Paris: Renouard, 1862. 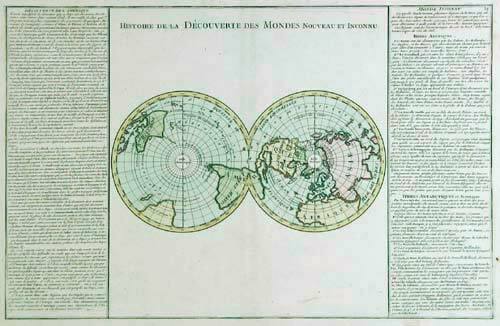 A large double-hemisphere map showing the world from the poles to the equator, with insets showing Magnetic Dip. Published in the 'Atlas Spheroidal & Universel de Géographie'. Miniature Map of the Southern Hemisphere. London: Faden, 1798. Still showing Tasmania as part of mainland Australia. London, 1704. Published by Churchill to illustrate the voyage of the Dane Jens Munk, who led a Danish expedition in search of the Northwest Passage in 1619-20, during which he was the first to completely map Hudson Bay. Here the Bay has two names, 'King Christians Sea' and 'The New Sea'; on the west shore is marked 'Monks Winter harbour'. Greenland is shown as a large landmass stretching from America almost to Spitzbergen. 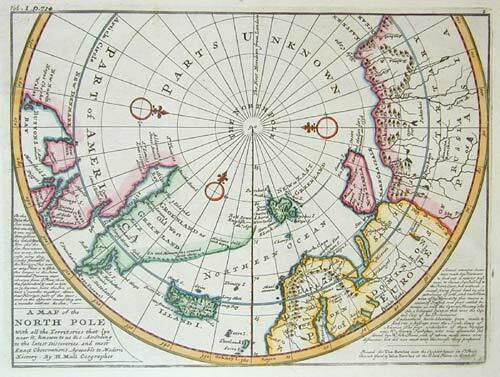 The mythical Frobisher's Passage through Greenland and island of Friesland are marked. London, 1704. The North Atlantic with the British Isles, Iceland, Greenland and Labrador. Also marked is the mythical island of Friesland. J. Covens & C. Mortier. Amsterdam, c.1740. 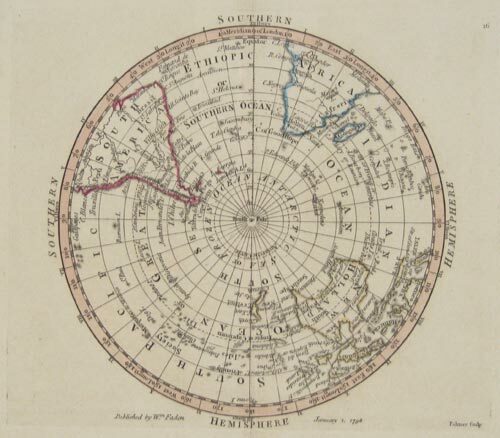 Detailed map of the Northern Hemisphere after De L'Isle. London, Thomas Bowles & John Bowles, 1745. Interesting North Pole map. Society for the Diffusion of Useful Knowledge. London: Baldwin & Cradock, 1831. 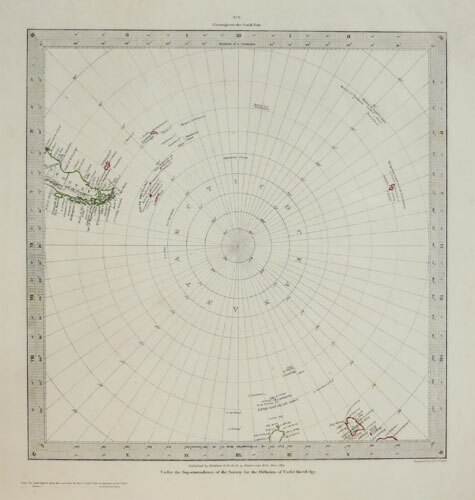 Map of the South Pole, showing the recently discovered lands, but not attempting to show the ice cap. Below South America are the South Shetlands (discovered by William Smith 1819) and South Orkneys (Powell & Palmer, 1821); south of New Zealand is Macquarie Island (Frederick Hasselborough, 1810); and in the southern Indian Ocean, Kerguelen Island, marked Isle of Desolation.